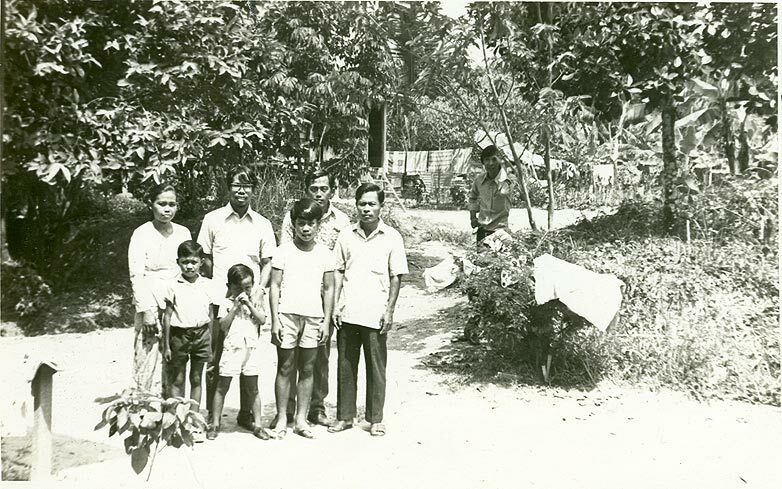 No 14, Lorong B4, Kampong Padan Dalam; L-to-R: Mat Zakaria, Detok (Bagio), a pupil, Mohd Md Yusof, and another pupil on BAB 7816. The accomodation had bitten us a bit. I could tell at Zubir's and Fadil's move; three of us owned a vespa each, and very independent to move about. The bite was harder when Abang Sehat had to move again, on Feb 5 Sat, this time to No 10, Jln 27, Sg Way New Village, a two-bedroom single storey terrace. Third and final term exam drew nearer. SAS was getting far away with the exit of the junior, and life at home was not getting any better. I began to live on the move on the bike. Many times I slept in lecture room, Tutorial room, Jimnasium, BTB and CTB, or anywhere I thought no one noticed, in Pantai Campus, some times with fellow non-boarder Majid (a Padang Midin mate) and Kamisan (Fadil's brother in-law), but many times alone; or in somebody else's place like of Yusof Karim in Mara Flat, Jalan Tandok, Bangsar. The Mary Fischer's and Morrison & Boyd's thick Organic Chemistry textbooks (both I bought using the honorarium money I received from Utusan) were always in the glove box of vespa, and they were my pillows on the bench in the lecture room. I dare not tried to sleep in the college with perpatual mate like Mohd Embong and Abdullah Yusof for fear of being caught by the college principal. My life began to disarray a bit. Eid Adha on Jan 26 Wed was in the middle of the exam which ended on Feb 4 Fri. Fadil took us to tutoring school children in Kg Pandan for their SRP or SPM, organised by more or less the Majlis Penduduk (Residence Council). With Zubir, and Mohd Md Yusof we moved in on Feb 6 Sun, on the very beginning of the long vac till May, to the given house to stay, No 14, Lorong B Empat, Kg Pandan Dalam. We were fed three times a day at Restoran Yurita. CheGu Jamaluddin, a primary school teacher in SR Kg Pandan, and En Rasani, a UK graduate reformist self-employed, were two prominent figures in the driving force team. I also took up a similar tutoring in Rantau Panjang, Kelang, organized by my fellow SAS-ian, Aziz Dollah, but it lasted a few weeks only; the turn-up was poor, as did the organizer. I even went to Dewan Bahasa dan Pustaka (DBP), on Feb 23 Wed, with Sharif Ninggal and Mohad Md Yusof, sitting for test to become a part-time translater. En Ariffin Siri conducted the test, and four days later I received the reply saying that I passed and in the list to be given translation jobs when it come; but I never recieved any such jobs. I went to scout also for anything to help in private publisher such as Persekutuan Preston (on Feb 24 Thu), with the same outcome. 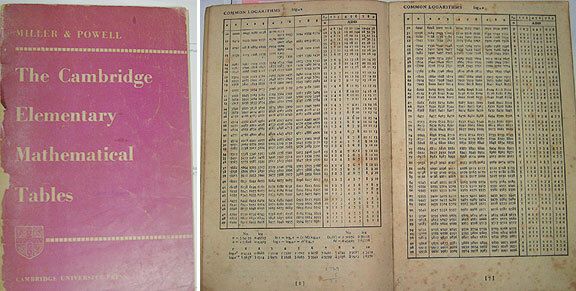 The amazing slide rule. Calculator was not yet available for students. The only machine available was "adding machine". For students it was log-book. Slide rule convert the log-book into scales on the ruler which has a sliding part to match. A slide rule to engineers and scientists in 1970's was like a stetoscope to doctors. 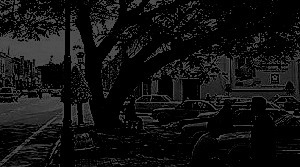 Taxi Stand, Jalan Mahkota, Kuantan, one dark night of Feb 18 Sat 1972, alone, I was looking for a ride to catch my father's burial. It was a trishaw rider who put me up in a sawn-timber lorry bound for K Trg; otherwise I would have to stay in the "rumah tumpangan" opposite the road, waiting sleeplessly for tomorrow. The results of First Year Science in UKM was published on Mar 10 Fri in the local newspaper, and I cleared to go on the Second Year comming May. But something suddenly happened at home; incident which took me many years to realise that it was a blessing in disguise in Feb last year of why I was not going to Australia. One Saturday evening, March 18, while I was tutoring in Sekolah Kebangsaan Kg Pandan, En Rasani, one of the organizer, called me. He said he just got a telephone call from Sg Way police station asking him to deliver a very sad news for me: that my dear father passed away this morning, accidentally drowned in Nerus river while he was taking his bath. I immediately decided to go home. En Rasani gave me fifty ringgit and another ten from CheGu Mohktar, another organiser, and Zubir took me on his Vespa to the Malacca Street taxi stand. By six in the evening I managed to get a taxi to reach Kuantan at past ten pm. My brain overworked that night to think how to get to K Terengganu or to stay alive in Kuantan. Suddenly an idea striked. I gave five ringgit to a trishaw rider to find any lorry which was going to KT, the alternative was to stay in a Rumah Tumpangan near the taxi stand and take the earliest bus tomorrow morning. Luckily he found one, a sawn-timber 6-wheeler, refuelling in a Shell station. So I was on the lorry to KT, at half past ten. In the journey I was thinking how on earth then I could go from KT to my house in the wee hours, not until I asked the lorry driver where exactly in KT he was going. It happened that he was going my way up to his home in Tanjung Gelam. The lorry passed by the main road to my house at about four in the morning, Sunday. I walked in the total darkness for about half km to frighten every body sleeping, not expecting my return in the dark of the night. When they finally ralised that it was I, every one got up, and my mother was especially very sad, she wept a lot for my father was buried yesterday evening, at about the same time I received the news from En Rasani. The last time I saw my father was in the morning of Sunday 21 November 1971, the moment I left after a short break before third term started the next day. I returned to Kg Pandan on Tuesday night by bus to reach on Wednesday morning. My pupil in class 3B (SRP) had collected a donation for me, all in coins, ammounting to about ten ringgit. I spent the rest of Feb, Mar, Apr, and May in Kampung Pandan, tutoring as the backbone source of my life-line; trying very hard, unsuccessfully, to butter the bread better. I had ample time to nurture my writing ambition the last year article in Mastika had leased its soul. I would have more time if I pose myself as less ordinary than others who from time to time visited us, especially those who stayed around KL like Hamdan and Ramli Hitam, and Supardito Bagio, an Indonesian, the son of a Secretary at the Indonesian Embassy, perhaps the first foreign student studying in UKM, with whom I would go whenever and wherever they go. My second article appeared in Dewan Masharakat Apr issue; I noticed it two days after I received a set of cuffling from Norilam who reminded me of my 21 years end on Apr 20 Thu; and another one appeared in Mingguan Malaysia on Apr 30 Sun. Our tenure in Kg Pandan ended on May 14 Sun, but the tutoring continued to the near of their SRP and SPM during the weekends; Bagio in the big Embassy's Holden Kingswood (3232 DC) helped moved our belonging then to UKM's first college in Pantai Baru where I would joined the PMUKM Leadership Course for a week. By then I have carved a niche in the local popular media, including Berita Minggu in which my first writing appeared on Jul 2 Sun from materials I gathered on PMUKM's Working Camp I joined May 26 Fri to May 28 in Sugai Merab, Selangor. PMUKM's Gemasiswa was published beginning this session and the chief editor, Chamhuri Siwar, had no problem in accepting my writings, then trying to glamourise with a nick "Hahanusa". Its maiden issue, Jilid 1 Bil 1, was in the campus on May 22. My first article was published in the following issue, Bil 2, Jun 20. 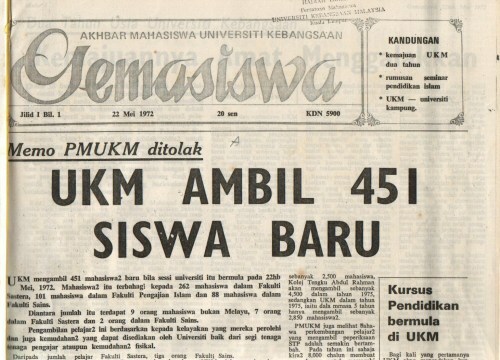 PMUKM's maiden issue of GEMASISWA, May 1972, a full-flaged printed campus newspaper of tabloid size complete with a KDN number. And it was all worked out by the students, from its news and article gathering, printing arrangements to its financial accounting without an iota of help from the university. The newspaper was sold to the members (students) for 20 sen a copy, and there was no unsold copy in every issue. And below, what was left after 17 years apart: photocopy type from a typewritten master on A4-size letter-headed; and it was done with a full help/cooperation from the university. It was distributed free to the members (students). It changed in what one described as: detoriate?, regress?, a fall? If the image of the students' campus newspaper is of any corelation to the students achievement and their status quo, then a similar description prevails the achievement of the post-90 university students. Was it intrinsic of the students or the 'help' of the university? 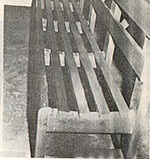 In 1972 the number of students were less than a thousand, in 1989 the number increased to more than ten times, but the quality state of the campus newspaper had reduced to more than ten times smaller; thus in effect it was more then 100 times degraded despite the more than 1000 times advancement in publication technological tools. 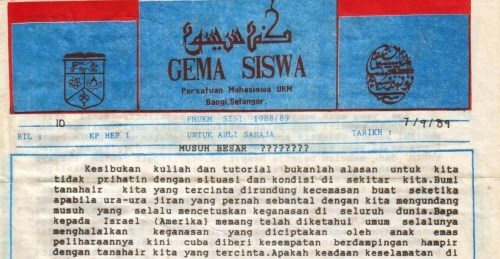 Perhaps in 1989 the students had published other much better publications; perhaps to them, GEMASISWA was an obsolete campus newspaper. No KDN, or denied KDN, the "newspaper" miniatured to 'for members only'. Imagine with ten thousand students, an RM each a month, there are more than a budget PMUKM could spend; but with an iff: iff the Gemasiswa could hold its status quo. My second year started on 29 May, Monday. UKM had changed its academic programme system to the so-called Quarter System; a year divided into four terms, and exams were performed and accumulated at the end of each quarter, more or less precursor to the Semester System. Subjects were disected into smaller course: calculus, modern physics, thermodynamics, linear algebra, computer science, chemistry, etc. ; examined and accumulated by the quarter, the first ended Aug 12 Sat. The lectures were conducted in Pantai Campus, while the practicals were carried in Section 16, the home of FPI. The following week (break) I joined another PMUKM's course: Press training Course, for a week in Pantai Campus (lodged in H10 with Rahim Parman). We listened to talks by many prominent national journalists and writers like Daud Saleh (Lever Brother), Dol Ramli (Director General RTM), Aziz Alias (Information Service), Jamil Sulong (Filem Negara), Subky Latif (Utusan), Alias Ali (Bernama), K.S.Kong (NST), S.H.Tan (Malay Mail - I was asked by Idris Jusi, the Course Director to chair the session, because the talk was in English and Idris said that I was good in it; incidently, S.H.Tan's writings were one of my favourite to read; one collection was "SWAY" by SHT, I never knew whether the writer was the same person), Samad Ismail (BH), Ahmad Nordin, Azah Aziz, Khoo Kay Kim, etc. Second Quarter began on Aug 28 Mon and ended after the last paper exam on Nov 24 Fri. Third Quarter started immediately (no break) the week beginning Nov 27 Mon. The new system demanded a constant attention which I could not afford because of too many non-academic variant that I had to deal with. It cost me dearly and I did not go through all the papers. My family needed me more than ever since the passing of my father. I forgot for a while that I was a student. On many occasions, I thought that getting a good grade was not a priority any more, lowest priority comparing to the urgency at home, my mother, my brother and my sisters. My elder brother had done all he could within his capacity, and in fact he had sacrificed his future for me and the family. My youngest brother and the youngest was born on Aug 16 Wed in my absence and in the presence of my next-younger berother Num. The accomodation in Sg Way had really bitten this time. Zubir suffered a strange illness, very serious, that his family had to take him home in the wee hours of June 24 Sat, for many days. When he returned he had to move to stay in Pantai College; and Fadil consequently moved to stay in Mara Flat, Jalan Tandok, Bangsar. Hamzah had also returned to Pantai College since before session break early this year. That left me alone in Sg Way. For that since the beginning of the session I always look forward to any reason not to sleep in Sg Way, and for many nights of each week I slept either in the lecture rooms in Pantai Campus, or squatted in Flat 45-C (Yusof Karim's) in Mara Flat, Bangsar. Involment in the campus activity became my defence mechanism as such in May 15 week (Leadership Training Course), May 28 weekend (Working Camp - my adopted family was of Haji Ahmad Keromo with whose family I kept the contact alive to these days), and Aug 14 week (Press Training Perogramme), all were organised by PMUKM. Trangganu Student Society annual meeting (chaired by Wan Shamsuddin Mamat, FPI) was on Jul 9 Sun, and my representation for Science Faculty was re-elected, although the society did not do much, except once this year on Nov 9 Thu, after eid, dialogue with CM, Datuk Nik Hassan in his official residence Batu Buruk. Science Student Society (PMSUKM) met on Sep 2 Sat, and I was elected to the EXCO, Math Dept Rep; and the following day, Ahmad Atory Hussein pulled me to attend the meeting of Non-Boarders Society (Organisasi Mahasiswa Luar Asrama - OMLA - to be affiliated with PMUKM) and the meeting gave me Information and Publication Secretary job the first newsletter (using typewriter) of which I published on Oct 17 Mon. Nonetheless Abang Sehat helped me to be known to Lim Bok Sin, a general contractor in Sg Way town who then trusted me in tutoring his children: a form 4 boy, a standard 6 girl, a standard 4 boy, and their elder sister who needed to be taught reading Bahasa Melayu so that she could read all the tender advert in the newspaper; once a week at 8 to ten at night for 80 RM monthly. The pay was rather fat, and I first did it on Jul 10 Mon. I tried very much not to miss the time table, even if I had to be absent from my own tutorial or in the middle of other programs. My service became a small news in Sg Way, on Oct 18 Wed another family wanted me to tutor their children, but I had to refuse for I could not afford another night a week. I kept the job throughout the year, and in the following year. Ramadan clocked in on Oct 9 Mon, and I managed to join another (11) bikes convoying home to Trengganu on Nov 3 Fri to spend the Eid on Nov 7 Tue with my family. Two days before the Eid, CheWan Bakar met an accident (bike-lorry) at Batu 6 roundabout and took his life. Perhaps he was the last "old man" around the mosque who had a bearing in the bringing up the surrounding children including myself. UKM's Sect 16 Campus, the former Kolej Islam Malaya, PJ, the home of FPI, and Chemistry Dept Laboratories. Without forseeing the blowing effect later, I did not realised that I had neglected the priority to give full attention to my lectures and homeworks and the lessons. On Saturday November 25, I moved from Sg Way Police Station to stay in the Second Residential College, Room C12, with Wan Mohamed Wan Muda my roomate, Section 16, the former KI PJ, UKM's FPI centre, and also Chemistry Department; the day before Third Quarter started on Nov 27 Mon, and the day I sent off my brother Num to Malacca Street, KL, with two others, en route to Ipoh for his diploma course in Politeknik Ungku Omar. I needed friends around, otherwise I would become a wild person, something that scared me since my childhood. This is actually my first close acquaintance with Wan Mohamed although I knew him (and idolised his star) since 1964 in Padang Midin for three years, then in SAS until 1969. Staying in Second College was confortable because I knew many of the residents (the FPI students many of them from Tok Jiring School) and they knew me too. Many non-FPI students stayed here. The chemistry practical were carried out here, but the others were in Pantai Baru. It was a restart for me here, but not necessarily a good start.